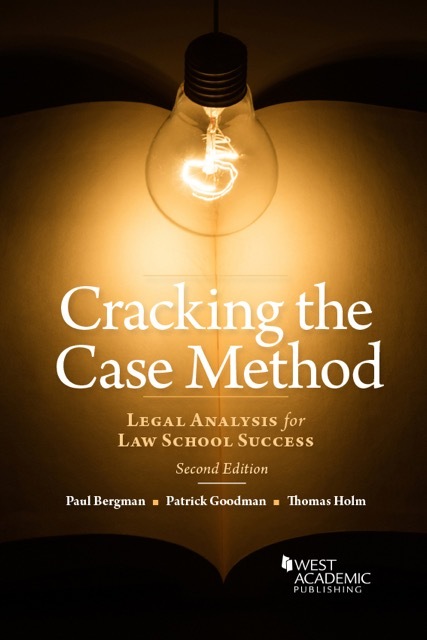 I recently wrote a post for PrawfsBlawg analyzing how 1L professors could use Cracking the Case Method—Legal Analysis for Law School Success to enhance their class instruction. Cracking helps both professors and students. Cracking demystifies law school and helps students acquire an analytic framework for understanding and applying legal principles. Professors can then teach higher-order legal analysis in their classes—to sophisticated students who prepare for class effectively, embrace ambiguity, and seek strong arguments rather than futilely prospecting for an illusory “correct” answer. And Cracking helps students master the analytical skills and learning strategies necessary for excelling on law school exams. This enables them to thrive even in classes where their professors may be relying on outdated teaching methods or neglecting to provide coherent syntheses of the law. Cracking succeeds where individual law school classes often fail: identifying and bridging the immense analytical gap between learning by the Case Method—discussing cases in isolation—and analyzing complex fact-hypotheticals on exams. Only available in print for seven months, the second edition of Cracking already is consistently one of the highest-rated books on Amazon’s list of legal self-help books. Get ready for fall and make your life better: assign or buy Cracking today!